Palm Beach Equine Clinic (PBEC), based in Wellington, FL, takes pride in being a world-class facility for the diagnosis, treatment, and recovery of some of the world's most valued sport horses as well as backyard companions. One piece of their program that helps the veterinarians of PBEC to diagnose subtle or acute lameness is its advanced imaging department. Producing thousands of scans a year across all modalities, the PBEC imaging department consists of digital radiography, ultrasonography, nuclear scintigraphy, standing magnetic resonance imaging (MRI), and its all-new computed tomography (CT) machine. Digital radiography is a modality now being used for routine equine imaging. The radiograph is a traditional x-ray made available within seconds for viewing and evaluation digitally. A veterinarian’s days in the darkroom are over thanks to this technology, which also allows on-screen adjustments much like editing a photo. An ultrasound machine generates high-frequency sound waves, which echo an image back to the machine where bone appears white, fluid appears black, and all other structures are on a grayscale. An ultrasound is non-invasive, usually does not require sedation, does not use radiation or require injecting radioactive isotopes, and provides real-time images. Nuclear scintigraphy is essentially a bone scan that begins with the injection of a radioactive isotope called Technetium 99. The isotope attaches to the phosphorous proteins localized within the bone and is absorbed. A nuclear isotope gamma ray camera is then used to capture images of the skeletal anatomy with a 360-degree view. Points of interest “light up” on the image to indicate increased metabolic activity and the site of injury. The standing MRI produces highly detailed images in several different planes to capture a complete image of a desired area. An MRI requires only light sedation and is best used to further define a specific area of bony or soft tissue that has been pinpointed as the origin of lameness. The CT scan is the newest and most flashy addition to PBEC’s imaging department. 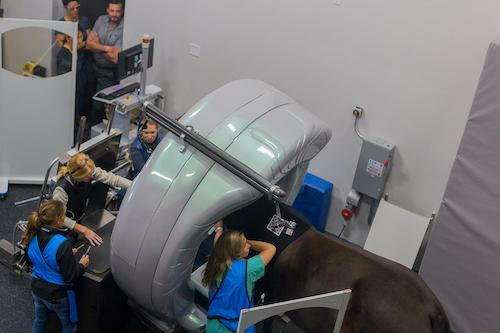 Much like a CT in humans, it allows veterinarians the unique opportunity to conveniently explore areas of a horse’s body that were previously unexplored. 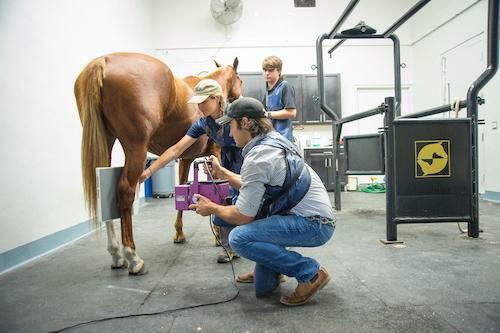 The machine produces 3-D images of a horse’s neck, spine, and head and can be conducted while a horse is standing and under light sedation. Brittany Cain, a PBEC veterinary technician and manager of the nuclear scintigraphy lab, attended Southern Illinois University and is fascinated by the structure of the horse’s body. This fascination led her to work her days in the lab that produces thousands of bone scans a year. “I’ve always had a strong interest in the anatomy of horses,” said Cain, who spends her time keeping horses comfortable and calm while operating a gamma ray camera housed in its own room at PBEC. “The horses are under light sedation and the scans usually take from one to two hours or, for full body scan, anywhere from two to four hours. Usually during the competition season we have anywhere from two to three horses being scanned a day. According to PBEC President, Dr. Scott Swerdlin, the latest in diagnostic equipment drives the success of the clinic. It is his goal to have PBEC be the most advanced referral center in the country. With that goal in mind, he took a giant leap into the future by equipping his veterinarians with state-of-the-art imaging, much of which is at the peak of diagnostic technology in both animals and humans. 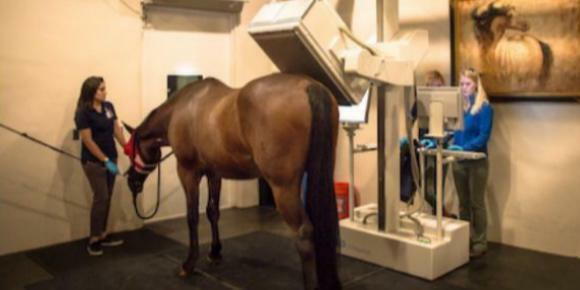 Changing the way veterinarians approach the evaluation of lameness in horses, the equipment like the standing MRI and CT is a relatively quick and low risk method used to diagnose and treat injuries more effectively.